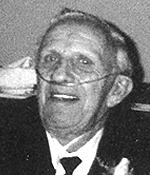 George E. Alexander, 75, of Security passed away on April 8, 2007 after a short illness. He was born April 28, 1931 in Quanah, Texas to William and Anne Lee (Blackburn) Alexander. He married Margie Brandon on July 7, 1950 in Quanah, Texas. George served in the US Navy from 1948-1952 and later worked in Civil Service. He and Margie moved to the Security area in 1959 where they raised their family. George is survived by his beloved Margie; his children, Bob Alexander, Jim Alexander, Deborah Alexander, Carla Alexander, Chris Sandusky, Kellie Owens, Jennifer Allen, Troy Allen and Samantha Allen. He was preceded in death by his parents. Visitation will be Tuesday, April 10, 2007 from 4-6P.M. at Dove-Witt Family Mortuary, 6630 S. Hwy 85/87, Fountain. Visitation will also occur on Thursday, April 13, 2007 from 8:00 A.M.-12:00 Noon at Smith Funeral Home in Goodlett, Texas. Graveside services will be at 2:00 P.M. on Thursday, April 12, 2007 at Goodlett Cemetery, Goodlett, Texas. The family requests memorial contributions be made to Pikes Peak Hospice, 825 E. Pikes Peak Avenue, Ste. 600, Colorado Springs, CO 80903.